An excellent smartphone adapter for telesopes, binoculars and spotting scopes, an ingenious design means this adapter allows easy imaging with your phone camera through virtually any optical instrument. A lightweight yet strong compact design with simple clamping to the eyepiece and adjustment of the phone position. Using the smartphone adapter on a telescope is as easy as possible, simply clamp over the eyepiece you are viewing with, adjust the phone position for the best view then focus and start taking images or even video. This is the easiest way to enjoy astroimaging with any telescope for immediate great results. Ideal for detailed shots of the Moon and Planets without costly equipment. An excellent choice for nature photography with binoculars and spotting scopes, simple fast setup. This adapter allows your phone camera to take images or video of what you are viewing through your instrument allowing you to capture those rare sights. The universal smartphone adapter will work with smartphones from 56mm - 81mm width and eyepiece diameters from 26mm - 51mm. Take advantage of modern smartphone cameras which are extremely high specification and capable of provinding superb images. 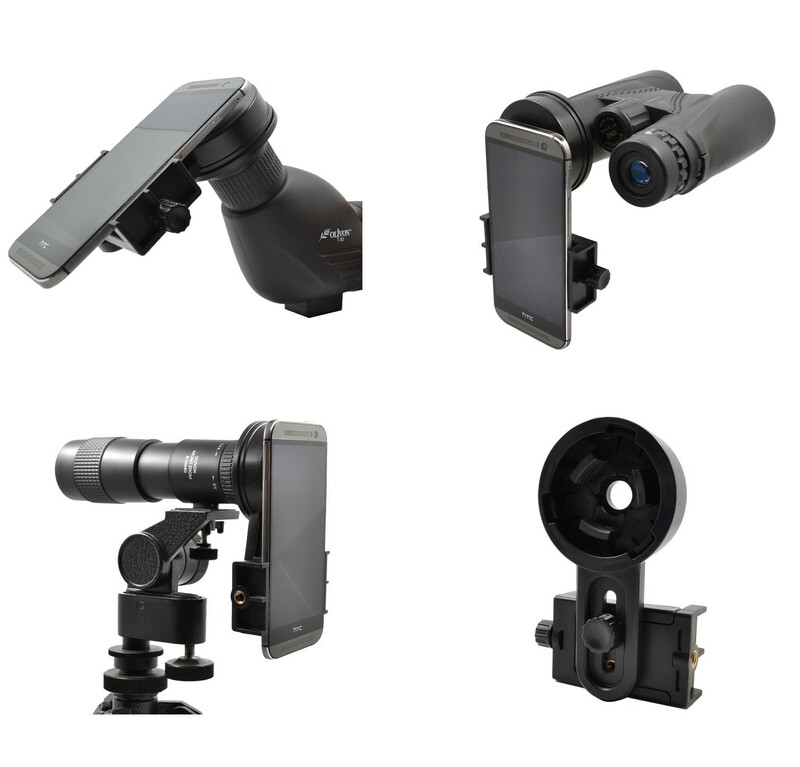 An excellent smartphone adapter by Visionary for telesopes, binoculars and spotting scopes, an ingenious design means this adapter allows easy imaging with your phone camera through virtually any optical instrument. A lightweight yet strong compact design with simple clamping to the eyepiece and adjustment of the phone position. Ideal for astroimaging with a telescope or nature photography with a spotting scope or binoculars just by attaching your phone camera. Smartphone cameras are now extremely high quality and can provide superb resuls.